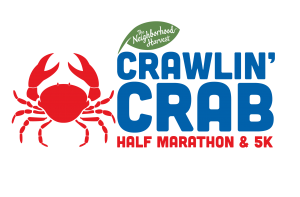 The Crawlin’ Crab Kids Kilometer is a race for children ages 12 and under. It will start and finish at the same start and finish line that is crossed by our Half Marathon and 5K participants. Guardians can accompany their child, but they need to be registered for the 5K, Half Marathon or a Guardian Bib in order to be allowed on the course.